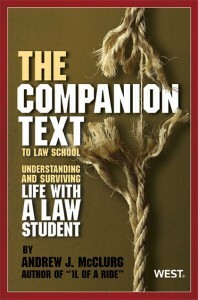 I will probably take some cues from the book, “The Companion Text to Law School,” each week or so for a blog post. Its author, Professor Andrew McClurg, kindly granted me permission to do so. Chapter Four is all about “The First-Year Curriculum.” Even though the descriptions of courses in the book are fairly brief, they are too long to recount here. Instead, I will do a little summary. Our first year students have four courses this semester. Three are considered “doctrinal” courses and the fourth is considered a “skills” course. Those words are a little fuzzy, but the students will tell you that the differences in the courses are stark. For the “doctrinal” courses — Civil Procedure, Property, and Torts — the students labor over reading cases, engage (often) in interactive dialogue with the professors in class, develop course outlines, and take multiple choice and essay final exams. In short, they are learning the legal “doctrine” of each subject area (hence, the name). For the “skills” course — Legal Research & Writing — the students learn the “skills” of conducting legal research and writing law office briefs and memoranda (complete with learning proper legal citation). Further, instead of a single semester-end final examination, the students in Legal Research & Writing are graded on several assignments over the course of the semester. * Civil Procedure: The students call this course “Civ Pro” (so get used to it!). The name of the course is fairly self-explanatory once you get a general idea of how the law works. There are two types of cases — civil and criminal. Any case that isn’t criminal is considered civil. These “civil” cases are governed by procedural rules, and this is what Civ Pro teaches. Specifically, the course focuses on the Federal Rules of Civil Procedure. * Torts: Professor McClurg writes, “A torts is a civil wrong other than a breach of contract (which is also a civil wrong) for which the law allows a plaintiff to seek money damages as compensation for his injuries.” That is Torts in a nutshell. Students learn about “intentional torts” (such as assault and battery) and subjects such as “products liability” (think of all those warning labels on all the products you buy! ), but they spend the bulk of the semester grappling with the topic of “negligence.” From now on, when you tell your student that she/he isn’t being “reasonable,” all that word will mean to them is Torts!!! * Legal Research & Writing: The students refer to this course by its initials, LRW (get used to that one, too!). LRW carries a heavy workload during the semester, but is not tested during the final examination period. There will be weeks when LRW assignments tend to dominate your student’s life, and these weeks in particular tend to produce the stress that characterizes law school (i.e., “How can I keep up with everything?”). However, many argue that there is not a more important course in law school than this one. Understanding doctrine is important, but conducting legal research and writing documents is what lawyers “do.” In LRW, the students will learn how to conduct legal research. Also, during the fall semester, the students will spend a lot of time learning how to write a “memo.” A memo sounds short, doesn’t it? Well, the finished product isn’t that long, but the students will spend hours and hours on their “memo.” Contrary to popular opinion, lawyers are taught to write in a concise manner. (This idea is summarized by a favorite quote of mine — maybe from G.K. Chesterton? — “I didn’t have time to write you a short letter, so I had to write you a long one.”) Also, in LRW, students become very familiar with something called “the Bluebook,” which is a system of legal citation. The good news is that your student is the one going to law school (not you), so you don’t have to understand any of these things. Still, I thought it might be helpful to get a basic idea of what they are wrestling with this semester as you learn to put up with them! I apologize for my absence this week. I fully intend to post every weekday throughout the academic year, but this week has been particularly challenging. My mother passed away early Sunday morning in Arkansas. I flew out that day. We had visitation Monday, and I had the honor of speaking at her funeral on Tuesday. I have been taking care of business matters today and will fly back to California tomorrow (Thursday). I cannot even count how many wonderful messages of support I have received in my absence — including many sweet notes from our new students. In addition, my colleagues have jumped in and covered for me this week. All of these experiences simply remind me that the Pepperdine Family really is a wonderful support system during the challenges we all face from time to time. Today, I simply wanted to provide you all with one date for your calendar. On Friday, September 28 (five weeks from today), we will host our annual Family Day at the law school. On this day, family members will have the chance to attend a first-year law class, a panel discussion about life as a law student, and the final round of the Armand Arabian Advocacy Tournament. Family Day is always a lot of fun, and for those that can make it, I hope you will make plans to attend. I do not have all of the specifics on Family Day just yet — they will be mailed to you before long (and I will share them here, too). What I do know is the date, the general plan, and that it isn’t easy for everyone to plan a trip to Malibu! I hope the advance notice will be helpful for planning purposes. If you are unable to attend Family Day, please know that you are still welcome to visit along the way. Family Day simply provides us the opportunity to design a particularly interesting day for you all. 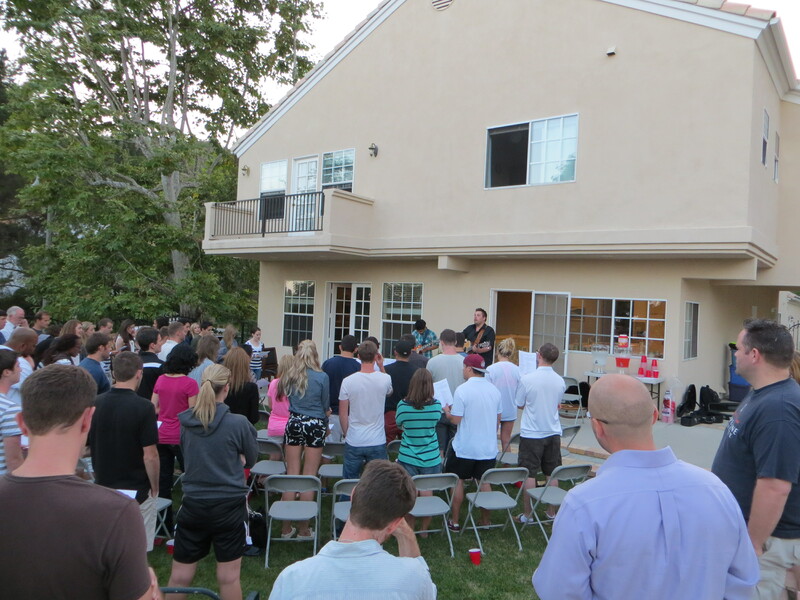 For years, many of the Christian students at Pepperdine Law gathered each Wednesday night at Vice Dean Tim Perrin’s house for a Bible study. Last spring, however, our beloved “Dean Perrin” was named president of his alma mater, Lubbock Christian University, and he and his family moved to Texas over the summer to begin work there. Immediately following the announcement (from Africa), Jim Gash (Dean Perrin’s very close friend) laid claim to the Wednesday night gathering and offered — yea, demanded! — to host it at his house! Last night was the first “Wednesday Night at the Gash’s,” and as you can see from the picture, a sizable crowd of students gathered to sing together, share encouragement, get to know one another, pray, and eat ice cream! Professor Jim Gash is a Torts professor for one third of our new students and teaches Evidence to upper division students. For the past seven years, he served as Associate Dean for Student Life: I am unbelievably honored to follow “Dean Gash” in this role. The good news in this succession is that Dean, now Professor Gash can finally pass on many of the administrative headaches that arise in the deans’ suite and get the opportunity to teach more. And, the good news for me, is that I now have the dual honor of working more closely with the students while being mentored by such a fantastic friend. If you want to know more about Professor Gash, you should check out his family’s blog that chronicles their six month adventure in Uganda. You can find it HERE. Today, I think I will be able to breathe enough to begin my follow up on our brand new Preceptor Program. We have 78 local, practicing attorneys and judges who have committed to serve as mentors to our first year students. About half of our preceptors were able to make it to our kickoff event at the close of orientation last Friday and meet their students (the picture above is from that event). I will now begin following up with those who were unable to attend. This is a fantastic opportunity for first year students to meet actual practitioners. Over the course of the coming year, they will have opportunities to spend time together and begin connecting the doctrine they are learning in class to actual practice. In addition, they instantly have a friend in the legal profession! To read a couple of paragraphs about our new preceptor program from the revamped “Student Life” portion of our website, go HERE. Well, the first day of school is in the books (ha! pun unintended). Best I can tell, it was a good day. For me, it felt as busy as orientation! But I survived, which to me qualifies as a success. I was thinking about that word “success” this morning. Part of my job duties is to direct our “academic success program.” Even with the adjective “academic” qualifying the word success, the word is still open to wide interpretation. For some, academic success means number one in the class, or top ten per cent. For others, it will be defined by survival — making it to graduation and passing the bar exam. In my mind, for these students, it means doing your best and getting the most out of your abilities, whatever that happens to look like on a grade sheet. But I think we all know that “academic” success is but a small sub-part of that larger word success. It goes without saying that law school is difficult, but it should be noted that it is likewise difficult on relationships. For our married students, we are particularly cognizant of this difficulty. As a law school, we feel that we will not be “successful” if we produce lawyers but destroy marriages. We want to do whatever we can to enhance, not damage, those precious relationships. I am happy that Sheila Bost, the wife of one of our professors (and former interim dean), Tom Bost, is offering a group for married students each semester. These small groups will meet for nine consecutive weeks. Each meeting will last 90 minutes. The total cost of the group for each couple is $40 and is limited to four couples. Sheila is a licensed Marriage and Family Therapist and will be the group facilitator. Sheila has been a Marriage and Family Therapist for 12 years and has worked in private practice with many couples to improve marriage and family relationships. Well, I feel like I am rambling this morning, but there is a point to this post (I promise). 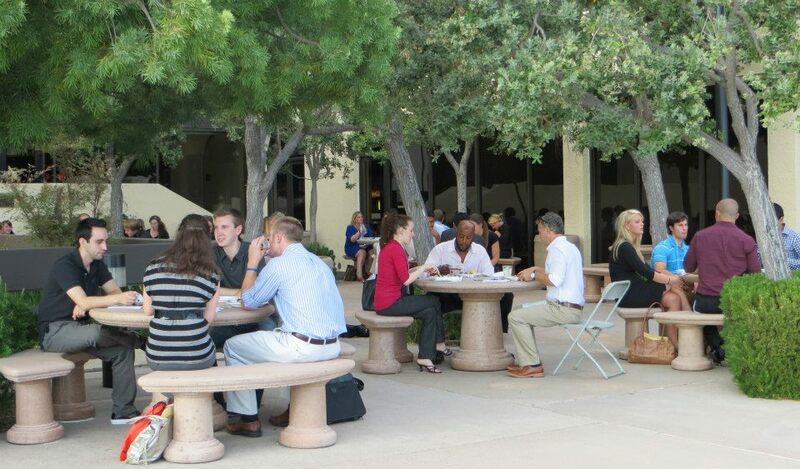 The point is this: At Pepperdine Law, we seek to define success more broadly than producing lawyers. We truly are interested in the whole student. As family and friends of our students, we want you to know that. When I decided to go to law school, I went to Barnes & Noble and picked up a book on the subject. It turned out that there were many. I probably should have done a little research to discover what was considered the best book on law school, but as my wife will confirm, I am a cheapskate, so I just snagged the most affordable (aka: cheapest) book on the shelf. I told Professor McClurg about my idea to have a blog for the family and friends of our law students, and he graciously granted permission to use excerpts from his book from time to time. If you are interested in a thorough book that will be helpful from “your” perspective, then I definitely recommend this book. HERE is a link to the book if you are interested in purchasing it. Up to you, of course – I will be highlighting parts of the book on this blog here and there. 1. Our faculty, deans, and directors will be at a retreat in Westlake, California, today in anticipation of the new school year! We are excited! 2. I hope your students enjoy this last day of freedom (although the prison metaphor is a bit much!). Maybe they will go to the beach or do a little sightseeing – or maybe just relax! The fun starts tomorrow, and we will keep them rather busy for quite some time.